Seven harps at a super low price. 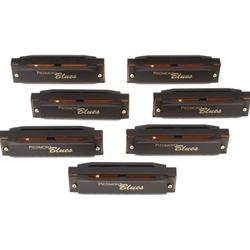 The Hohner Piedmont Blues 7-Harmonica Pack with Case is a great value. Includes 7 harps with Hohner-quality brass reeds, aluminum plates, precision-molded combs, and a plush-lined nylon case. Keys: G, A, Bb, C, D, E, and F (lowest to highest). Hohner includes a Bb harp for playing cross-harp in the key of Fâ€”a favorite key of harmonica greats like Little Walter.